Spider-Man has been my favourite fictional character since I was five-years-old. Between collecting far too many toys, to avidly watching the ’60s and ’90s animated series, to even yelling at my kindergarten teacher for not referring to me as “Spider-Man,” the character has been a meaningful part of my life for as long as I can remember. 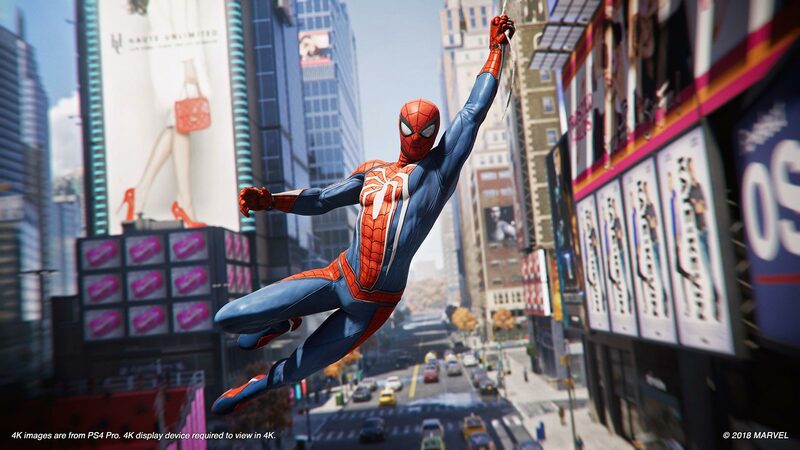 That’s why the prospect of Marvel’s Spider-Man, developed by Ratchet and Clank makers Insomniac Games for the PlayStation 4, is so exciting. Rather than being yet another movie tie-in or forgettable free-to-play mobile game, Insomniac was a making a bonafide AAA original singleplayer console game. Thankfully, my hope was well-placed — Insomniac has created the Spider-Man game I’ve always dreamed of. In a welcome deviation from Tom Holland’s excellent high-schooler version of Spider-Man in the Marvel Cinematic Universe, Insomniac has instead focused on a Peter Parker who has been fighting crime for eight years. With a more seasoned Spider-Man, Insomniac can also fully explore Peter’s burgeoning career as a scientist. Where Peter actually works is a wonderful surprise I won’t ruin here, but suffice it to say that the developers — alongside consulting Spider-Man comic writers Dan Slott and Christos Gage — have placed a heavy emphasis on Peter’s brilliant but often-overlooked intellect. 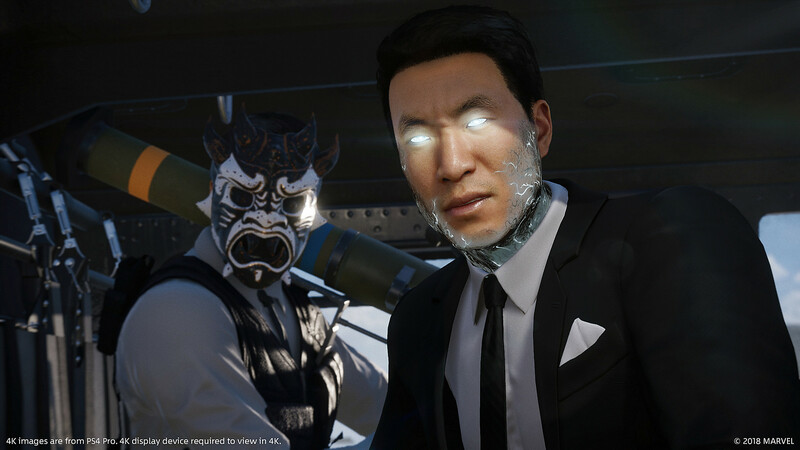 For much of the game, Spidey will be facing off against Mister Negative, a mysterious crime boss with intriguing ties to Peter’s Aunt May and his best friend Harry’s father, New York Mayor Norman Osborn. Along the way, Miles Morales, who comic fans might recognize as the black-and-red suited Spider-Man, also gets involved. Miles is at the heart of some of Spider-Man‘s most powerful moments, particularly in endearing scenes shared with both Peter and Spider-Man, easily making him one of the game’s most standout characters. Insomniac has also created perhaps my favourite interpretation of Mary Jane to date. Oftentimes, Spider-Man stories stick the vivacious redhead in a stereotypical supporting role as a damsel in distress or doting romantic partner. 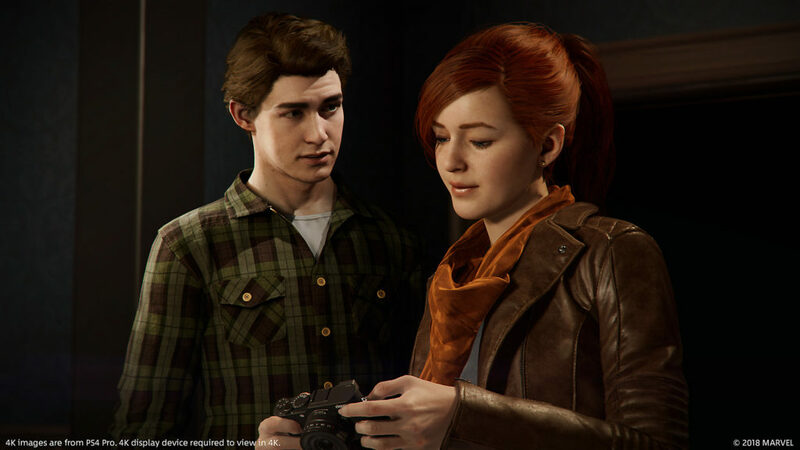 In Insomniac’s story, however, MJ is much more of an actual three-dimensional character, having worked hard to become one of The Daily Bugle‘s top reporters after Peter quit the paper to pursue science. This puts an incredibly refreshing spin on the pair’s classic dynamic, where the two must work together — in spite of complicated romantic history — to learn more about the ongoing criminal threat. This makes their relationship feel much less one-sided and far more like an actual partnership, one that is further brought to life through well-written dialogue and Yuri Lowenthal and Laura Bailey’s charming performances. The real star of the show, though, is the “mystery character” teased during PlayStation’s E3 conference this past June. I won’t reveal this person’s identity, but seeing his poignant relationship with Peter build up over the course of the game also made this one of the all-time greatest depictions of the character. Unfortunately, while most of the lead heroes and villains are exceptionally well-written, four of the ‘Sinister Six’ members are rather underserved by the plot in comparison. In a particularly big missed opportunity, Insomniac doesn’t actually have them interact with one another much at all, thus cheapening the whole idea of a team of supervillains. Thankfully, this isn’t enough to hinder the otherwise outstanding narrative, which culminates in a riveting and emotional finale. In typical Marvel movie fashion, the game also features two credit scenes that hint at what may come in planned downloadable content or a hypothetical sequel. In addition to offering up a superb Spider-Man story, Insomniac has also created the best gameplay mechanics for the character in any game to date. Chief among these systems is the web-swinging, which is deftly brought to life through simple and intuitive controls. To start, holding R2 while airborne will shoot out a web-line towards a nearby surface, after which you can freely control the trajectory of Spidey’s swing. Release the trigger mid-arc and you’ll shoot forward with a burst of speed, while letting go at the apex will launch Spidey higher. You can also hold ‘L3’ to dive to help your next web-line gain speed and altitude. Meanwhile, a tap of the X button will shoot out a Web Zip for a quick horizontal burst — especially useful when not near a building. Simultaneously pressing L2 and R2 when aiming at a specific perch will let Spider-Man Web Zip towards it, he can then launch himself off of for continued speed. When not swinging, holding R2 will have Spider-Man parkour over low objects or run up buildings. All of these mechanics come together to make the most precise, responsive and thrilling web-swinging ever featured in a video game. No other game has fully captured the magnificent rush that comes from diving off a building, shooting out a web-line right before hitting the ground, swinging between cars and then launching yourself back to the sky with graceful acrobatics. As a nice touch, John Paesano’s rousing score also plays when swinging, further adding to the awesome and heroic feel of web-swinging. Combat is similarly engaging, thanks to a focus on Spider-Man’s incredible reflexes and dexterity. 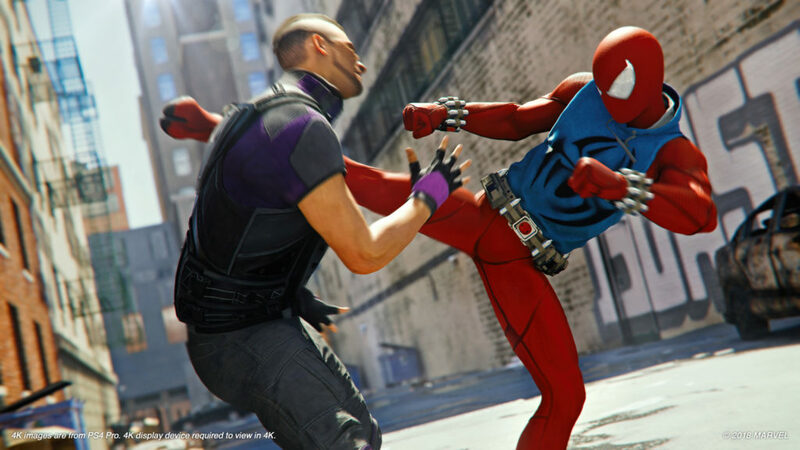 In between punching and kicking your enemies, you’ll have to dodge incoming attacks that are marked with a flash of Spider-Man’s Spider-Sense. 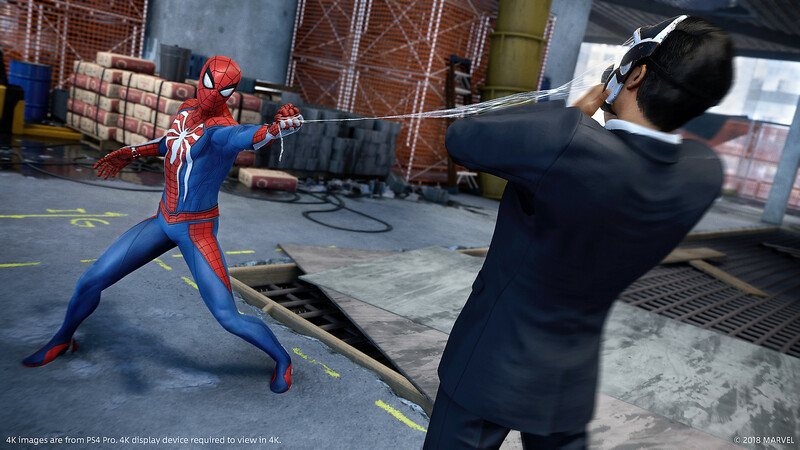 Evading right before an attack hits will carry out a ‘Perfect Dodge,’ which helps fill Spider-Man’s Focus bar used to perform stylish special takedowns. Successfully pulling off a Perfect Dodge right as a stream of bullets is about to hit you always feels deeply satisfying. Unlockable skills can further enhance Spidey’s evasive abilities by having him blind the enemy with webbing or even briefly slow down time after a Perfect Dodge. 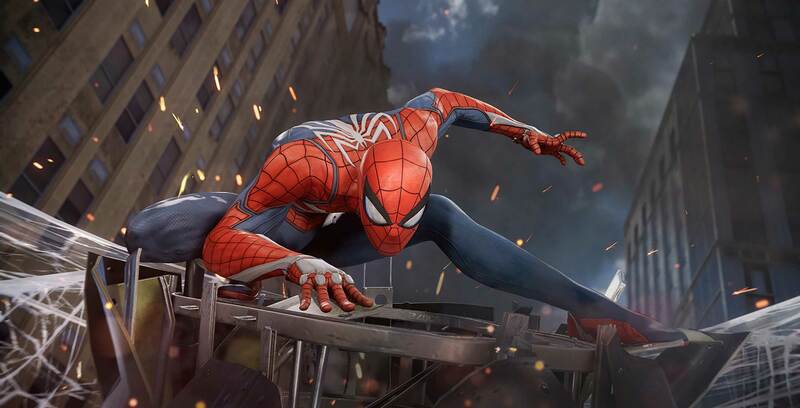 Beyond dodging, Insomniac also encourages players to constantly shift between ground and aerial combat. 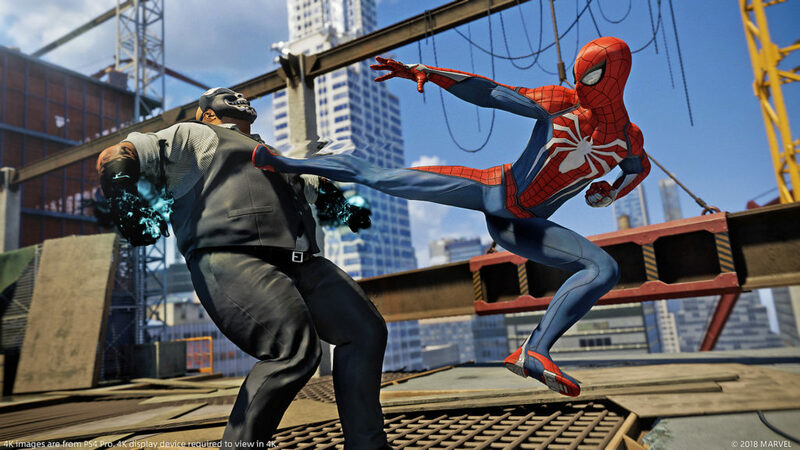 At any point, Spider-Man can launch an enemy into the air, during which time he can either leap to continue his combo or web-slam his foe back to the floor. Hopping between grounded and airborne enemies is seamless and wonderfully captures Spider-Man’s incredible agility. Meanwhile, Peter can incorporate some of the neat gadgets he’s designed into combat to gain a further edge over his foes, including the small group-entrapping Web Bomb, and — my personal favourite — the Web Shot, a highly concentrated blast of webbing that sends enemies flying and sticks them to whatever surface they hit. There are also a number of stealth sections in the game that allow you to use contextual silent takedowns. These scenarios are set up well enough to accommodate a few different strategies, but more importantly are almost always optional, allowing you to jump in and start punching if you so choose. Certain instances will even have you play as Mary Jane, who has to rely on sneaking around and using her wit to survive. These sections may be less interesting gameplay-wise, but they do offer a welcome change of pace, while more importantly paying off in later Spidey-MJ scenes. 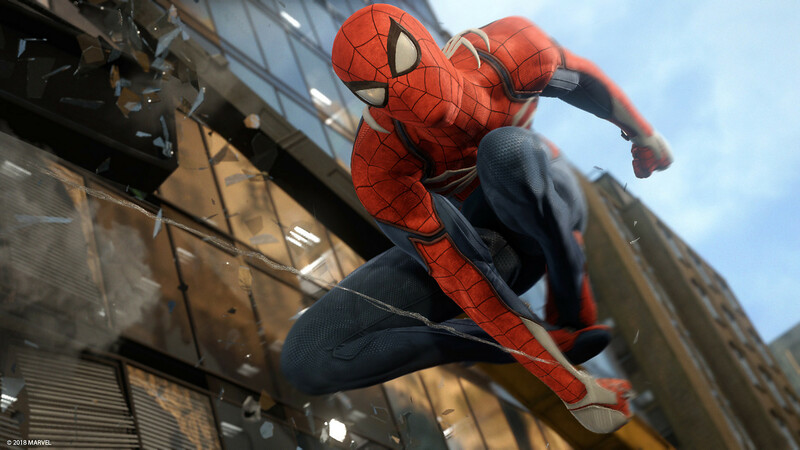 Outside of the campaign, Spider-Man features a wide variety of side missions, including various citizen quests, horde mode-style gang hideouts, random crimes, ranked challenges and even a mystery involving occasional Spider-Man flame Black Cat. Exploring the meticulously crafted New York — filled with many great Marvel easter eggs like Avengers Tower — is also a highlight. Surprisingly, though, I found finding collectibles to be the most enjoyable of the game’s side content. Throughout New York, you can collect backpacks that Peter has left strewn about during his eight years of crime fighting. Each time you pick one up, Peter will comment on an item in the bag, whether it’s a recipe he used while trying and failing to cook for Mary Jane or a memento from a villain he’s faced. It’s a brilliant way to flesh out the backstory and personality of this more experienced Peter and made the act of looking for collectibles — which can often feel trivial and tedious — actually feel meaningful and interesting. You’ll also have a good time unlocking new abilities, suits and outfit modifications. Specifically, I enjoyed discovering all of the 24-plus suits, which feature their own unique special moves and are pulled from a wide variety of media, including last year’s stellar Spider-Man: Homecoming and the more obscure Spider-Man Noir comics. In the end, Marvel’s Spider-Man is a masterful achievement because Marvel and Sony found the perfect developer for the job. Insomniac Games’ deep reverence for the character is apparent throughout all facets of the game, be it in the refreshingly original yet faithful take on 55-plus years of comics, expertly crafted web-swinging and fluid superhero combat. 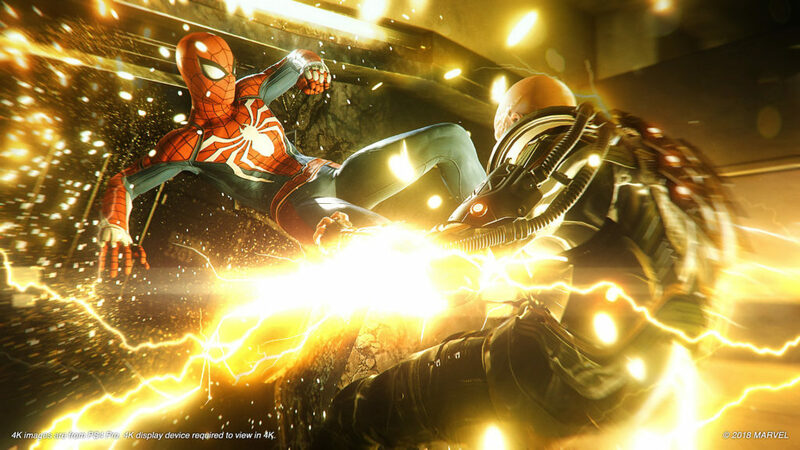 Whether you’re a fan of the Web-Head or are just looking for a compelling singleplayer experience, Marvel’s Spider-Man most definitely has something for you. It’s not only Spider-Man’s greatest gaming adventure, but also one of this generation’s best titles. 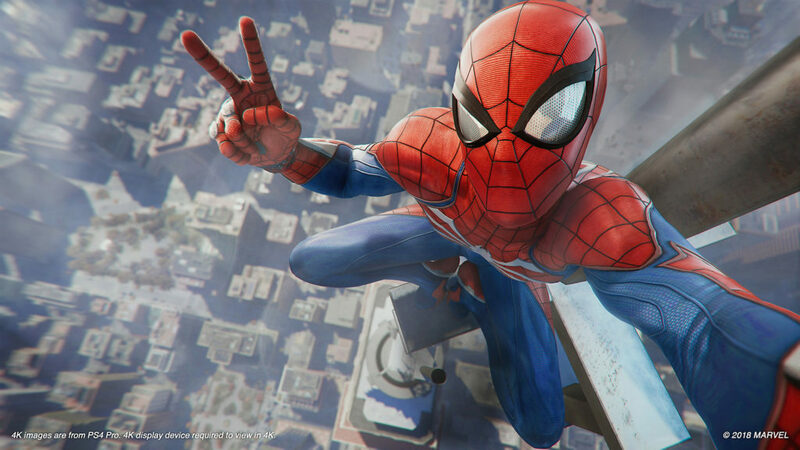 Marvel’s Spider-Man will launch exclusively on the PlayStation 4 on September 7th. The game will also feature enhanced 2160p visuals on the PlayStation 4 Pro.